Have you played in any of ACR’s Million Dollar Tournaments? Million Dollar Sundays have been profitable for savvy poker players in 2018! Have you seen the big overlays in the weekly $1,000,001 GTD Million Dollar Sundays? 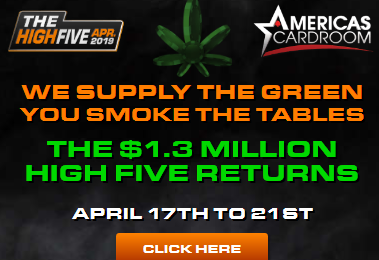 Americas Cardroom just had their biggest one yet last Sunday at $186,000! These tourneys continue to offer amazing value for all current and prospective players, so make sure to use it as an opportunity to win some life changing money on the next one this coming weekend (February 11th at 2pm ET). Don’t forget that all new players can claim the ACR Welcome Package too. All First Time Depositors are eligible for a 100% bonus up to $1,000, 20 Days of Free Cash Play on ACR’s Jackpot Poker Tables (up to a $50 value) and access to New Depositor Freerolls. ACR Tournament Schedule with the next 7 Million Dollar Tournaments scheduled! The Next Million Dollar Tournament on ACR is scheduled for Feb. 11, with more coming each upcoming Sunday on Feb, 18th and 25th and One every Sunday in March on March 4th, 11th, 18th and 25th. The MDS (Million Dollar Sunday) $1,000,001 GTD Tournaments start at 2PM ET, have a $250+15 buy-in, get a 10,000 chip stack, have 15 minute blinds and usually run for 8 or 9 hours (sounds like a lot, but the payoff is worth the time when you win). Yes, that’s right! You see a 1st place prize of $179,000 for the winner of a poker tournament that didn’t even cover it’s own guarantee. In fact the top 9 finishers wins were 5 figures or more. The last 3 Million Dollar tourneys on ACR have paid similar amounts. Go on ACR Now and see everything that their offering you today.